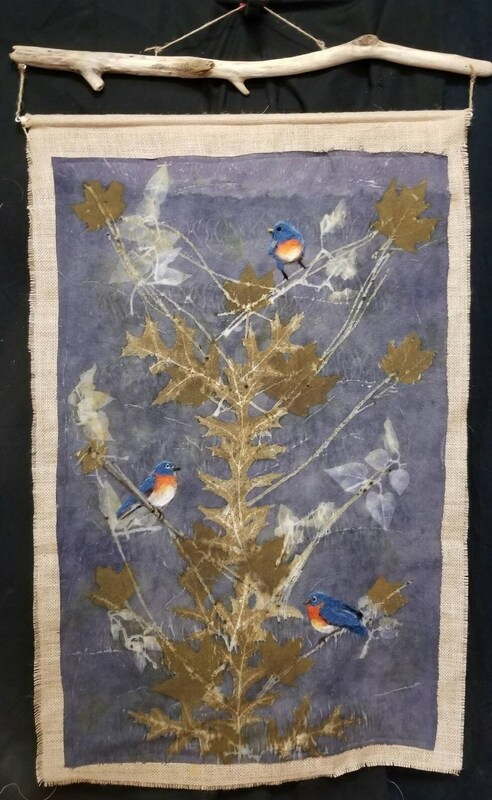 Bluebirds,Ecoprinted Silk Wall Hanging with Hand Felted Birds & Backing, Driftwood Hanger, All Natural,by Artist,Wall Art,Decor,26 x 40 in. These are custom made and this one has sold. Contact me with your requests!
" The Bluebird Tree". This beautiful,one of a kind, wall hanging is eco-printed on pure raw silk (much heavier than a silk scarf) and its unique leaf designs come from oak, maple and sumac leaves I have collected on my rural NC farm. Hand dipped in a natural logwood dye for the rich, deep background color! I added 3 charming little birds of my own design by hand felting them onto the "branches" of the leafy design. I added a rustic burlap backing to complement the final piece with its driftwood hanger. Every eco-printed wall hanging comes with a tag with the story of its making. A unique and unusual gift! Eco dyeing or printing is the collecting and steaming of Nature's plants, leaves and grasses to form beautiful, permanent designs on fibers. The results are incredibly beautiful, unpredictable and that is what makes it such an exciting and unique art form! These colors are the ACTUAL colors from the plants. The shapes are the actual shapes from the plants. The wool and alpaca hair is all natural. Everything hand crafted in my rural NC studio.